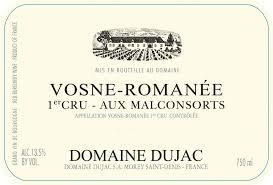 2016 Dujac Vosne Romanee 1er Aux Malconsorts - $450.00: Vins Rare, The finest selection of rare wines. A more deeply pitched and cool array of violet, spice, dark currant, earth and floral aromas introduce the rich, robust and obviously powerful big-bodied flavors that brim with minerality on the driving and built-to-age finish. Textbook Malconsorts in every sense including the need to age it. In short, this is a knockout. Burghound 94 Outstanding!